The abacus, or soroban as it is called in Japan, is one of the first objects that strongly attracts the attention of the foreigner in Japan. When he buys a few trifling articles at some store, he soon notices that the tradesman does not perplex himself with mental arithmetic, but instead seizes his soroban, prepare it by a tilt and a rattling sweep of his hand, and after a deft manipulation of rapid clicks, reads off the price. It is true that the Japanese tradesman often uses his board and beads even when the problem is simple enough to be done in one's head, but this is only because the use of the abacus has become a habit with him. If he tried, he could no doubt easily add 37 and 48 in his head. But such is the force of habit that he does not try to recognize the simplicity of any problem; instead, following the line of least resistance, he adjusts his soroban for manipulation, and begins clicking the beads, thus escaping any need of mental effort. Doubtlessly the Westerner, with his belief in the powers of mental arithmetic and the modern calculating machine, often mistrusts the efficiency of such a primitive looking instrument. However, his mistrust of the soroban is likely to be transformed into admiration when he gains some knowledge concerning it. For the soroban, which can perform in a fraction of time, a difficult arithmetic calculation that the Westerner could do laboriously only by means of pencil and paper, possesses distinct advantages over mental and written arithmetic. The Japanese tradesman with his soroban would easily outstrip a rapid and accurate Western accountant even with his adding machine. "The machine age tool took a step backward yesterday at the Emie Pyle Theater as the abacus, centuries old, dealt defeat to the most up-to-date electric machine now being used by the United States Government...The abacus victory was decisive." "Civilization, on the threshold of the atomic age, tottered Monday afternoon as the 2,000-year-old abacus beat the electric calculating machine in adding, subtracting, dividing and a problem including all three with multiplication thrown in, according to UP. Only in multiplication alone did the machine triumph..."
The American representative of the calculating machine was Pvt. Thomas Nathan Wood of the 20th Finance Disbursing Section of General MacArthur's headquarters, who had been selected in an arithmetic contest as the most expert operator of the electric calculator in Japan. The Japanese representative was Mr. Kiyoshi Matsuzaki, a champion operator of the abacus in the Savings Bureau of the Ministry of Postal Administration. As may be seen from the results tabulated on the following page [sic], the abacus scored a total of 4 points as against 1 point for the electric calculator. Such results should convince even the most skeptical that, at least so far as addition and subtraction are concerned, the abacus possesses an indisputable advantage over the calculating machine. Its advantages in the fields of multiplication and division, however, were not so decisively demonstrated. Burroughs Adding Machine Company supplied U.S. Armed Forces with calculators. In 1946 I was in the Army stationed in Tokyo, Japan. We lived in downtown Tokyo and had easy access to recreational facilities. The Ernie Pyle Theater usually presented some sort of stage presentation followed by a recent film. My wife and I went regularly because the stage presentations were special. I clearly remember the contest between the abacus and calculator. That it was impressive is evidenced by my clear remembrance to this day. I was surprised and delighted to see mention of that event in your home page. The news excerpts don't mention the model of the electric calculator used in the contest. My research discovered that the Burroughs Adding Machine Company supplied U.S. Armed Forces with calculating machines beginning in 1942. 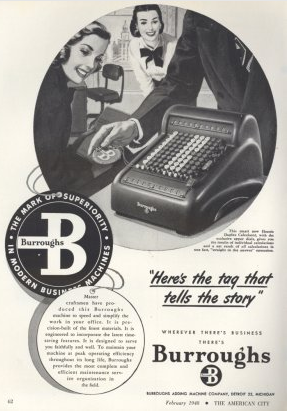 I then searched for images of a 1948 calculating machine manufactured by Burroughs and found the advertisement, shown in the sidebar above, from the February 1948 issue of "American City" magazine, a trade journal.